Sam with a milky ribbon worm, found in Chincoteague, VA. This week, we interviewed marine educator Sam Lucas about one of her favorite topics - marine worms! It seems like marine worms are one of the most overlooked groups of ocean animals. What do you think is so exciting about them? I’ve been fascinated with marine invertebrates since I was a kid. My mom and I would go to the invertebrate house at the Smithsonian’s National Zoo frequently, and it was my favorite exhibit! Naturally, I’ve always thought marine worms were “cool” – I love seeing their different adaptations, shapes, and sizes! Are there many different species of marine worms? How many? I do not have an exact number, however invertebrates (terrestrial and marine) account for 97% of species on earth. There are six phyla that contain marine worm species: Platyhelminthes (flatworms), Nematoda (roundworms), Annelida (segmented worms), Chaetognatha (arrow worms), Hemichordata (acorn worms), and Phoronida (horseshoe worms). Within just Phylum Annelida there are about 8,000 known polychaete species found throughout the world’s seas! Do they range in size? How small or large can they be? Yes, they come in so many shapes and sizes. The largest recorded marine worm is the bootlace worm, clocking in at 180 feet! The smallest recorded marine worm is a species of nematode that is microscopic, measuring as long as a piece of paper is thick. In regards to body shape, there is great diversity – some are flat, segmented, ringed, or even covered in bristles. How many species of marine worms can we find on Sanibel? I am not sure, but lots! This would be great to start recording with our Sanibel Sea School classes! I have only personally seen a few so far: a parchment tube worm, a plumed worm, a peanut worm, a lugworm, and the horseshoe crab flatworm. Where do marine worms live? Do they like to live close together or far apart? Marine worms are found throughout the world’s oceans from salt marshes to coral reefs to deep sea hydrothermal vents. They can be found burrowed into the mud or sand, under rocks, in algae, free swimming, or attached to their host. Some species are colonial, so you can find hundreds in one place. Others are solitary and spend their life burrowed into the substrate or free swimming and foraging for food. Tell us about their lifestyle. What do they eat and how do they spend their time? There are quite a few different ways marine worms spend their time. Some marine worms live an active lifestyle and can be found swimming through the water or foraging along the sea floor. On the other hand, some species create burrows or construct casing that are anchored within the sediment, and many spend the majority of their lives in these locations. Parasitic marine worms will spend a large amount of time on their host species whether it is a fish, crab, or mollusk. Do they interact with (or harm) other organisms at all? Mutualism: When two organisms benefit from the activity of one another. 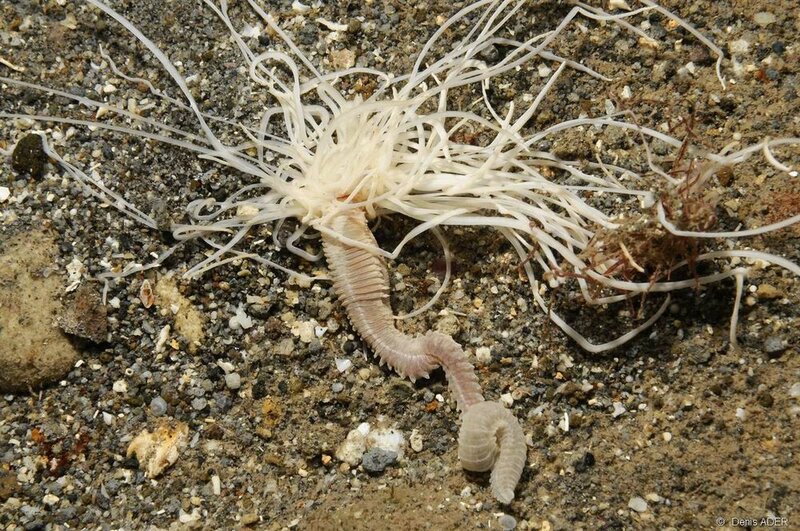 The Osedax species burrows into the bones of decaying animals on the seafloor. The worm houses bacteria which are able to break down bone material. As the bacteria live within the worm, they are able to easily gain access to fresh bones, thus feeding both the bacteria and the worm as the bone is degraded. Commensalism: When one organism will benefit while the other is neither helped or harmed. An example of this is the horseshoe crab flatworm. The flatworm is an ectoparasite and will spend its entire life on the horseshoe crab’s appendages, carapace, and book gills. As the horseshoe crab feeds, the flatworm will feed off of particles that find their way onto the horseshoe crab’s ectoskeleton. Parasitism: When one organism (the parasite) lives on or within another organism (the host) and benefits by obtaining nutrients at the host’s expense. A tape worm, Schistocephalus solidus, parasitizes three separate hosts to complete its life cycle: a copepod, a fish, and a bird. The first intermediate host is a copepod. The copepod consumes the free-swimming larvae of the tapeworm. The copepod is then consumed by a three-spined stickleback. As the parasite inhabits its secondary intermediate host, it begins to grow within the abdomen, often times becoming even larger than the host itself! As this is happening, it is also infecting the host and altering its brain chemistry and responses. The fish reacts to these changes through risk-taking behaviors and a heighted flight response. These behaviors will increase the chances that the final host, a bird, will prey upon the infected fish. Once the parasite has reached the final host, it will reach reproductive maturity and produce eggs within the intestines of the bird. The worm will die off once all of its eggs have been produced, and the bird will expel the eggs back into the environment, starting the cycle all over again. Woah, that example of parasitism is really cool! Do worms play an important role in the larger ecosystem? Yes, marine worms are an important food source to many animals in our oceans. In addition, many are decomposers and feed off of detritus. A neat fact I discovered is that lugworms are known as the “earthworms of the sea”! Lugworms turn over sand, which oxygenates the upper layers of the sediment and provide nutrients through their excrement as they feed on detritus within the sediment. 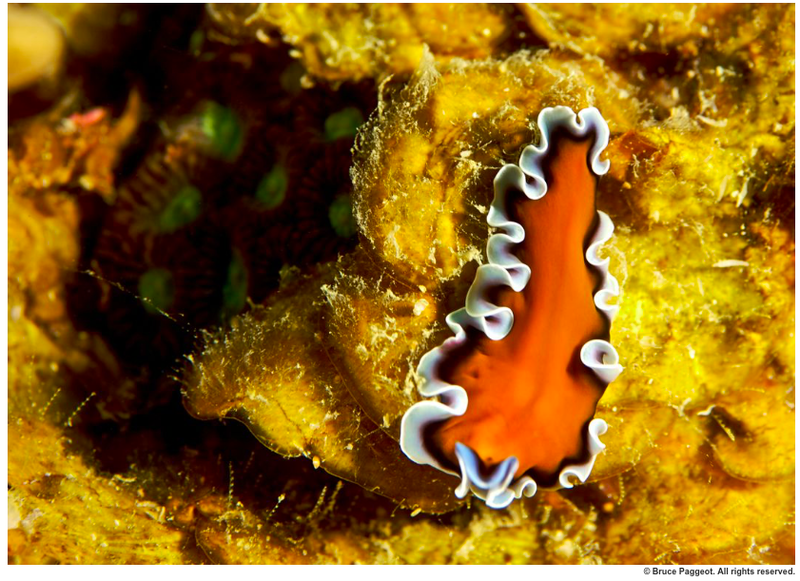 Do you have a favorite type of marine worm? I think the plumed worm (also known as the decorator worm) is my favorite! They are fairly elusive and I have mostly only stumbled upon their casings while out in the field. Plumed worms can be found on mud and sand flats, where they construct casings out of materials from their surrounding environment. When I was working up north, I would find their casings in muddy intertidal zones. Their casing would be made out of this muddy sediment mixed with algae. Here on Sanibel, I’ve found the casings and they are completely made of out of shells – a stark contrast! Also, I once found a GIGANTIC milky ribbon worm (almost as long as my wingspan) while sieving in the mudflats in Chincoteague, VA. I’d say that this was one of my most exciting finds! I've heard that certain marine worms might be able to digest plastics - is that true? What do researchers know? Yes, this is true. Scientists at the Korean Institute of Ocean Science and Technology have discovered polychaetes feeding on plastic within Styrofoam buoys. Unfortunately, this activity is not beneficial to the worm or to the environment. Ingesting plastic causes the worms growth to slow and causes the worms to produce more microplastics through extrication. The researchers found that as the worms ingested the plastics, the adults then produced 11,200 plastics particles while juveniles produced 2,470 plastic particles. Another study, conducted by Plymouth University, found that as the worms ingest plastics this can transfer pollutants and additives to their body, thus reducing the worm’s health and impacting those that prey on it. Unfortunately, worms may not be the solution to our plastic pollution problems. A Christmas tree worm (https://oceanservice.noaa.gov/facts/xmas-tree.html).